I am here, but why? …was the initial question asked at the Festival do Mapeamento at Ay Carmela! But, instead of writing about the festival now I also asked this question in the context of my thesis. My obvious answer: do (empirical) research about a methodology of applying mobile (communication) devices and their potentials in the struggle of marginalized people/community in urban areas by realizing a practical (participatory/emancipatory/autonomous) urban mapping project where people document their local urban environment and make use of the gathered information (ie. on a digital map) to provoke a transformation of the situation and to empower the people/community. In theory, this sounds good but in practice, however, several fundamental problems and contradictions arise which made me rethink the objectives of the research project which I will lay out in the next paragraphs. The greatest difficulty is the establishment of contacts to social movements and collectives who’s struggle is related to the urban issues such as lack of housing, the right to the city, gentrification, informal settlements and informal work, etc. One promising contact with the Rede de Comunidades do Extremo Sul de São Paulo didn’t advance further due to the fact that the collective is still very new, with a small number of people which are busy with their struggle thus have little or no time to accompany the proposed mapping project. Their argumentation is absolutely right which made me (re)think the various concepts and terms used in the research proposal for this master thesis. Hence the following paragraphs try to give an overview about the various facets of terms like participation, empowerment or digital exclusion and their current (and conceptually often limited) usage in the research proposal. – buzzword community: until now, the term community has been used (more or less) as a synonym of a (apparently homogeneous) group of people with whom the research project could be realized. The impression could have been that the research project aimed to be conducted with all people of that particular community and neglected the fact that the community is a complex and heterogeneous social world (Hickey and Mohan, 2004, p.17), a space of situated practice that is socially constructed (Massey in Hickey and Mohan, 2004, p.16) where not everybody may be interested in a (development) project or has other (more pressing) reasons not to participate. This is obvious if the community is seen as a place with its own past and present, where different social and political practices were and are exercised, where people have different needs (Young in Mohan and Hickey, 2004, p.64), where various types of resistance take place (also against intended development brought from outside) (Vincent, 2004, p.111), where power structures exist, where inequalities can be found related to questions of gender, race, age or class, all overlapping and in relation to another (Young in Mohan and Hickey, 2004, p.64). Closely related to the community is the local and the aim to locally empower the community without taking into account, that development outside the local scope has often caused the situation that is aimed to be transformed locally. As Hickey and Mohan (2004, p.10) note: “[…] the ‘community’ has periodically been destroyed by underlying processes of development, only to be resurrected as the proper source of recovery through trustee-led intervention”. – buzzwords transformation and empowerment: the research project seeks for transformation and empowerment by using technology nobody has asked for (to put it bluntly). In its current state, the project proposal doesn’t give an answer to the question of intended transformation once a practice of mapping/reporting has been established and gathered information are available on a digital map. On the one hand, this no drawback because the type of transformation and empowerment depends on the local context and can therefore only be determined by those people that would realize the project. On the other hand, one could argue that any transformation and empowerment that is intended to happen, should be of political nature as well, rather then solely technical. The intended transformation is of political nature once a formerly non-existing political space is created by those that are marginalized, socially excluded and not permitted to speak, in order to articulate themselves and to challenge, contest and transform the status quo (Rancière in Kastner, 2008). If the research project was conducted as proposed, its initial focus would lay on a more technical empowerment as a solution for a problem that is often of institutional nature, if we think about urban processes such as lack of housing, replacement of people, state led redevelopment of city quarters and the resulting gentrification processes, social segregation and repression. The roots of those local problems and processes are often not determined locally but exist due to broader and structural inequalities and exclusion caused on institutional level (Narayan et al in Gaventa, 2004, p.26). Institutional is used here as a generic term that refers to authorities and agents of the public/governmental/civic sphere, private and non-governmental authorities (Gaventa, 2004, p.35), that exercise power on local, state and global level and affect the life of the people (Gaventa, 2004, p.25). Therefore, this wider institutional space must be contested and transformed as well in order to achieve sustainable and lasting local transformation (Mohan and Stoke in Gaventa, 2004, p.36). The usage of new media and electronic communication (as part of the research of the thesis and the proposed project) can be considered as political because it creates and distributes (mass) information (via the internet) which challenge those established and centralized mass media institutions (tv, radio, newspaper) that were and are necessary for institutional agents in order to distribute their message to the people (Castells, 2007, p.4). The research project proposal would focus on the construction a local view generated by the community in the first place (by using ICT) and would probably also lead to personal development around confidence, identity and sense of the collective. Information and communication technology (ICT) and the assessment of its possibilities and limitations in the context of the (local) struggle would cover the usage of mobile devices for participatory (p2p) information production, distribution and usage, the creation, editing and purpose of digital maps with services and tools such as openstreetmap or flickr, or micro blogging and open publishing platforms such as identi.ca or indymedia, just to name a few of them. What is currently missing is the link between the usage of those produced information and their concrete role in the creation of political space, which depends also on empowerment by creating political capital or political capabilities (Williams, 2004, p.95). As summarized by Hickey and Mohan (2004, p.11), political empowerment would include the understanding of how existing structures of power, oppression and injustice operate. In order to establish such a knowledge, more then 5 month (the intended duration of the research project) are necessary (in my opinion) because information about existing institutional processes and power structures that would be necessary to address and contest, must have been be acquired in the first place. Despite the importance to transform the wider context that affect the peoples life, it should not be forgotten that a transformation must also take place on individual level (Edwards and Sen in Waddington and Mohan, 2004, p.222), thus we return to the necessary deconstruction of the apparent homogeneous local (community and space), where often similar (visible and hidden) power structures and hierarchies exists (Cornwall, 2004, p.84) as those to be addressed in the wider context. Those local structures must be made transparent and contested as well in order be emancipatory and to avoid their repetition (Foucault in Cornwall, 2004, p.81). This point can also be seen from another perspective, for example where systems of decision making are already existing on a community level and where any form of external participation would aim to override those systems (Mohan and Waddington, 2004, p.221) or where marginalized members of society developed their own way of decision making and participation in community processes (Mohan and Hickey, 2004, p.66). Another concern about radical emancipatory practice is the existence of local power structures and the interdependence between the strong and weak in that relation, which could prevent the weak from exercising emancipatory practices because they would threaten the inequalities (between the poor and rich) at the costs of reduced livelihood (of the weak, because their livelihood formation may be depended on the strong in that relation), thus a further increase of poverty would occur (Cleaver, 2004, p.275). – buzzword digital divide: the term digital divide is one aspect of the broader structures of social inequalities (Alcántara, 2002, p.v). The digital divide can not only be considered as lack of physical access to information technology (such as access to computers and internet) but has much more dimension. Van Dijk (2000, 2002) for example determines four types of lacking access to ICT in order to draw a framework that conceptualize the digital divide in a more inclusive manner: material access (ie, lack to infrastructure), mental access (ie. lack of interest, unattractiveness of the technology), skill access (ie. lack of skills and knowledge), usage access (ie. lack of usage opportunities). Servon (2002, p.9) determines similar factors: again the lack of physical access, the lack of it-literacy or education and skills and the lack of useful (digital) information and content for those at the wrong side of the digital divide. Similar thoughts can be found in Nicks Couldry’s reflections on the digital divide (2002, p.10) where he argues that beyond physical access to ICT, other questions are probably more important: does the internet offer appropriate content (usage access), do the people feel that the usage and production of (digital) media suits their needs and strengthens their position as valid parts of society (mental access). More definitions and frameworks are existing (see for example bridges.org or tlrp.org) and will be analyzed more comprehensively in the course of this thesis. What is important for this initial reflection on participation is the fact that the intended research project would lead to skill improvement in various areas, as explained above, and to the creation of own content, potentially accompanied by an increase of interest in the used technologies and media. – buzzword participation: The research project proposal is very flexible and open for adjustments, changes and contesting, actually its is anticipated that participants incorporate their (local) knowledge, discuss new proposals an finally realize it in an autonomous, emancipatory and self-organized way. The question is whether this kind of participation is anticipated solely or if an additional perspective on participation should be taken into account as well? As suggested by Whitehead and Gray-Molina (in Williams, 2004, p.95), empowerment would also seek to struggle for participation in and transformation of institutional space. The already mentioned creation and occupation of a previously non-existing political space in order to radically challenge and change institutions from within and from outside/against them (Cornwall in Williams, 2004, p.97) would generate new forms of participation beyond the community/local level. New rules that deconstruct, reshape and renegotiate institutional space would be created and necessary knowledge and skills would be acquired (political empowerment) in order to move through that space and to understand how individual life is impacted by it (Hickey and Mohan, 2004, p.14). Participation in the contesting of institutional space may lead to deeper structural changes then those (often technical and local) projects that use participation as a methodology in order to “prove its participatory credentials” (Hickey and Mohan, p.16) and which just implements a “technical fix for complex problems of uneven development” (Cleaver, Rahman in Hickey and Mohan, p.59). Those technocratic approaches that only focus on the local have led to a depoliticization of participation because participation takes only place within the limited framework of a project (Hickey and Mohan, 2004, p.10). The right for citizenship: one definition of citizenship can be read as “that set of practices (juridical, political, economic or cultural) which define a person as a competent member of society, and which as a consequence shape the flow of resources to persons and social groups” (Turner in Mohan and Hickey, 2004, p. 66). Here, at least two interpretations of citizenship can be found. From a liberal point of view, citizenship is just a set of rights and obligations granted by state to its citizens (Gaventa, 2004, p.29), thus it is solely a juridically defined status and offers a very limited space for navigation (Mohan and Hickey, 2004, p.66) because citizens are usually not involved in decision making carried out by institutions, merely they are seen as receivers, clients, consumers or subjects (Steward in Mohan and Hickey, 2004, p.66). On the opposite, citizenship can be seen as a right of all citizens (Gaventa, 2004, p.29) to actively shape and transform the society they live in, towards a society with “of equal worth and decision-making capabilities” (Mohan and Hickey, 2004, p.66). “The political communities which provide the contexts of democratic citizenship…are able to encompass group as well as individual citizenship and their social sites are potentially widespread, both subnational and transnational, the city and the region as well as the community and the federation”. Thus, citizenship is a tricky concept due to the fact that according to one view, one perquisite would be a functioning (democratic) state whose institutions are at least willing to share or reduce their power in favor to an equal voice of the people in decision making processes (participatory democracy in favor to representative democracy), while citizenship is difficult to imagine in regimes of repression and oppression (Williams, 2004, p.96). Another shortcoming of certain views is their neglecting of other groups (or identities) within a society, that, for instance, don’t consider themselves as part of “a” state, such as indigenous groups, tribes, nomads or other ethnic groups that are often assembled under the cover of a “state“, sometimes artificially constructed, as in the case of former colonies (Mamdani in Mohan and Hickey, 2004, p.68). In addition to ethnic groups, it should also be taken into account that people don’t feel themselves as part of the society they live in, which lost trust in society/institutions or believe that an equal society is impossible to achieve (Couldry, 2002, p.13-14) and therefore oppose the right to citizenship. The right to the city: the right to the city is a special case and applicable as well because the thesis research is situated in the urban context and its marginalized societies. In his text Le droit à la ville (Lefebvre in Holm, 2010), Henri Lefebvre defines the city as space that is constructed by social practices (this includes all kind of practices that shape the city, local to institutional) and that constructs those practices vice versa while the right to the city is defined as a re-appropriation of the city (for example by marginalized social groups) in terms of equal access to physical urban spaces (infrastructure, spaces of knowledge, spaces of societies wealth), the right for collective gathering, negotiation and contention and the right for cultural exchange and communication (Holm, 2010), all together merged to the right for a life in an equitable society, in an autonomous and self-organized manner, that contest and deconstruct the capitalistic city and society (Lopes de Souza, 2010), or, as David Harvey describes it, the right to the city is the “claim [of] some kind of shaping power over the processes of urbanization, over the ways in which our cities are made and re-made and to do so in a fundamental and radical way”. This notion of shaping power can be directly connected to creation of political space to reclaim citizenship and the right to the city as previously defined. Various contemporary (social) movements worldwide explicitly struggle for the right to the city. Among them are Abahlali baseMjondolo from Cape Town/South Africa, which launched their campaign in June 2010, the Recht auf Stadt movement in Hamburg/Germany or The Right to the City Alliance in New York City/USA, to name just a few of them. Frente da Luta por Moradia (FLM), an amalgamation of (autonomous) urban social movements and collectives which aim for a popular and permanent struggle for housing, the implementation of urban habitation programs and related political instruments for the poor, low income workers/households and socially excluded in São Paulo (FLM, 2010). Movimento Nacional dos Catadores de Materias Recicláveis (MNCR), the national movement of waste collectors and recyclers (pt. catador) is an independent (from public and private institutions) and self organized movement which exist since 2004. Its objectives are to rise public awareness about the importance and benefits of the catadores work and the formation of solidarity among the catadores by promoting their organization in cooperatives, associations or groups, in contrast to individualism and competition (MNCR, 2008b). Their struggle for the right to the city is defined as the free movement through and free work in the streets of the cities and their centres (MNCR, 2008a) [see also corresponding poster as pdf]. Terra Livre is a popular movement of the countryside and the city that seeks for a fundamental change of society, organized from below by the Brazilian people – the workers, students, homeless, landless, intellectuals, from the city and the countryside. Their struggle is directed to transformations in many areas, two prominent examples are the fight for an agrarian reform in order to collectively cultivate land (free, without ownership) in order to produce food for all people, the right of housing for the working/low income/poor in the city and the countryside and the construction of public power, organized non hierarchically and in basic democratic fashion(Terra Livre, 2008). Forum Centro Vivo demands the right to the city (center) of São Paulo in terms of democratic use of public space and access to the cities centers, public participation in and formation of the cities urban development institutions and processes (such as the Subprefeitura do Centro), free access (for disabled and non-disabled, excluded, elderly, children, etc) to the various forms of physical and social spaces the center offers (culture, transport, work, etc), formation of solidarity economies and the right for information (FCV, 2005, p.2). From a less (none) radical point of view, two institutional approaches should also be mentioned as examples towards the right to the city. Their emphasis lay clearly on citizenship realized (mainly) through participation in decision making processes, thus participation in invited (institutional) spaces. O Movimento Nossa São Paulo represents a network of more than 600 social and public movements/institution in the city of São Paulo. It struggles for the right to the city/citizenship in the institutional space by monitoring public organs, increase transparency in public decision making processes and promotion of participatory governance by providing an online/virtual platform that invites citizens to submit ideas and proposal that could transform the city (MNSP, 2010). Instituto Polis is based in São Paulo as well and aims towards the implementation of urban policies and an Urban Reform on country, state and municipality levels. It therefore provides formation of knowledge (in social movements and public administration) in order to implement the intended Urban Reform which declares among others, the right to the city, the right for housing, instruments for the protection of human-, environmental-, cultural-, social-, and economic rights (Instituto Pólis, 2010). To come to an end for now, it may be worth to take a look the following interview with Sokari Ekine (2010) at the re:publica 10. She reminds us that technology alone won’t solve any wider structures of social inequalities and exclusion but that at the end of the day, every single individual is responsible for acting towards empowerment and transformation. Ekine, S., 2010. Technologie allein kann uns keine bessere Zukunft verschaffen. Available at: http://www.spreeblick.com/2010/04/21/interview-mit-sokari-ekine-technologie-allein-kann-uns-keine-bessere-zukunft-verschaffen/ [Accessed July 19, 2010]. Harvey, D., 2008b. The right to the city (pt1), Lund University, Department of Geography. Available at: http://vodpod.com/watch/1278571-david-harvey-the-right-to-the-city# [Accessed July 21, 2010]. Harvey, D., 2008c. 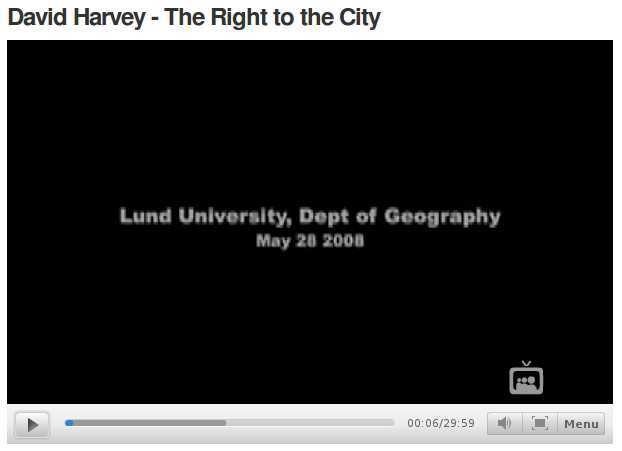 The right to the city (pt2), Lund University, Department of Geography. Available at: http://vodpod.com/watch/1278575-david-harvery-the-right-to-the-city-part-2 [Accessed July 21, 2010]. MNCR, 2008a. Cartaz de campanha pelo direito á Cidade. Available at: http://www.mncr.org.br/box_3/publicacoes-on-line/cartaz%20semtebro%20verde.pdf/view [Accessed July 19, 2010]. Abahlali baseMjondolo, 2010. The high cost of the right to the city. Pambazuka News. Available at: http://www.pambazuka.org/en/category/features/63126/print [Accessed July 19, 2010]. Alcántara, C.H.D., 2001. The Development Divide in a Digital Age – An Issues Paper. Available at: http://citeseerx.ist.psu.edu/viewdoc/download?doi=10.1.1.97.2925&rep=rep1&type=pdf [Accessed July 18, 2010]. bridges.org, 2004. Real Access / Real Impact criteria. bridges.org. Available at: http://www.bridges.org/Real_Access [Accessed July 19, 2010]. Castells, M., 2007. Communication, Power and Counter-power in the Network Society. 2007. Available at: http://ijoc.org/ojs/index.php/ijoc/article/view/46/35. Cleaver, F., 2004. The social embeddedness of agency and decision-making. In Participation: from tyranny to transformation? Exploring new approaches to to participation in development. London; New York: ZED Books Ltd; Distributed exclusively in the U.S. by Palgrave Macmillan, pp. 271-277. Cornwall, A., 2004. Spaces for transformation? reflection on issues of power and difference in participation in development. In Participation: from tyranny to transformation? Exploring new approaches to to participation in development. London; New York: ZED Books Ltd; Distributed exclusively in the U.S. by Palgrave Macmillan, pp. 75-91. Couldry, N., 2002. The forgotten digital divide: researching social exclusion/inclusion in the age of personalized media. In Media in Transition: Globalisation and Convergence conference. p. 20. Available at: http://web.mit.edu/cms/Events/mit2/Abstracts/NickCouldry.pdf [Accessed July 18, 2010]. van Dijk, J., 2002. A Framework for Digital Divide Research. University of Twente. Available at: http://www.utwente.nl/gw/vandijk/research/digital_divide/Digital_Divide_overigen/a_framework_for_digital_divide.doc/ [Accessed July 19, 2010]. van Dijk, J., 2000. The Digital Divide as a Complex and Dynamic Phenomenon. In 50th Annual Conference of the International Communication Association. Acapulco. Available at: http://citeseerx.ist.psu.edu/viewdoc/download?doi=10.1.1.98.2068&rep=rep1&type=pdf [Accessed July 18, 2010]. Ekine, S. et al., 2009. Sms Uprising Mobile Phone Activism in Africa., Gardners Books. Ekine, S. & Miclovich, V., 2010. re:bublica 10: Mobile Activism in Africa, Berlin. Available at: http://www.youtube.com/watch?v=DJ25jyKyMuo&feature=PlayList&p=7DD21AC42F015FC1&playnext_from=PL&playnext=1&index=25 [Accessed July 21, 2010]. FCV, 2005. VIOLAÇÕES DOS DIREITOS HUMANOS NO CENTRO DE SÃO PAULO: propostas e reinvidicações para políticas públicas, São Paulo: Forum Centro vivo. Available at: http://dossie.centrovivo.org/imagem/dossie_cd.pdf [Accessed July 20, 2010]. FLM, 2010. Luta. Frente de Luta por Moradia. Available at: http://www.portalflm.com.br/luta-historico [Accessed July 20, 2010]. Gaventa, J., 2004. Towards participatory governance: assessing the transformative possibilities. In Participation: from tyranny to transformation? Exploring new approaches to to participation in development. London; New York: ZED Books Ltd; Distributed exclusively in the U.S. by Palgrave Macmillan, pp. 25-41. Harvey, D., 2008a. The Right to the City. New Left Review, (53). Available at: http://www.newleftreview.org/?page=article&view=2740 [Accessed July 19, 2010]. Hickey, S. & Mohan, G., 2004a. Relocating participation within radical politics of development: critical modernism and citizenship. In Participation: from tyranny to transformation? Exploring new approaches to to participation in development. London; New York: ZED Books Ltd; Distributed exclusively in the U.S. by Palgrave Macmillan, pp. 59-74. Hickey, S. & Mohan, G., 2004b. Towards participation as transformation: critical themes and challenges. In Participation: from tyranny to transformation? Exploring new approaches to to participation in development. London; New York: ZED Books Ltd; Distributed exclusively in the U.S. by Palgrave Macmillan, pp. 3-24. Hickey, S. & Mohan, G., 2004. Participation, from tyranny to transformation? : exploring new approaches to participation in development 1. ed., London; New York: ZED Books Ltd; Distributed exclusively in the U.S. by Palgrave Macmillan. Holm, A., 2010. „Recht auf Stadt“ – Mehr als ein guter Slogan? hEft, für literatur, stadt und alltag, (21), 32-33. Instituto Pólis, 2010. Direito á Cidade: Apresentação. Instituto Pólis. Available at: http://www.polis.org.br/tematicas1.asp?cd_camada1=14&cd_camada2=125 [Accessed July 22, 2010]. Kastner, J., 2008. Die Aufteilung des Gemeinsamen. graswurzelrevolution, (332), 15-16. Lefebvre, H., 1974. Le droit à la ville suivi de Espace et politique, Paris: Ed. du Seuil. Lopes de Souza, M., 2010. Welches Recht auf welche Stadt? Ein Plädoyer für politisch-strategische Klarheit. Phase 2. Available at: http://phase2.nadir.org/rechts.php?artikel=786&print= [Accessed July 19, 2010]. MNCR, 2008b. O que é o Movimento? MNCR – Movimento Nacional dos Catadores de Materiais Recicláveis. Available at: http://www.mncr.org.br/box_1/o-que-e-o-movimento [Accessed July 25, 2010]. MNSP, 2010. Carta de Princípios do Movimento Nossa São Paulo. Movimento Nossa São Paulo. Available at: http://www.nossasaopaulo.org.br/portal/cartaprincipios [Accessed July 20, 2010]. Mohan, G. & Waddington, M., 2004. Failing forward: going beyond PRA and imposed forms of participation. In Participation: from tyranny to transformation? Exploring new approaches to to participation in development. London; New York: ZED Books Ltd; Distributed exclusively in the U.S. by Palgrave Macmillan, pp. 219-234. Servon, L., 2002. Redefining the Digital Divide. In Bridging the Digital Divide: Technology, Community, and Public Policy. Wiley-Blackwell, pp. 1-23. Available at: http://www.blackwellpublishing.com/content/BPL_Images/Content_store/Sample_chapter/0631232419/servon.pdf [Accessed July 18, 2010]. Terra Livre, 2008. Manifesto. Terra Livre. Available at: http://terralivre.org/manifesto/ [Accessed July 19, 2010]. tlrp.org, 2009. Digital Inclusion Commentary Site. Digital Inclusion Commentary Site. Available at: http://www.tlrp.org/tel/digital_inclusion_writing/ [Accessed July 19, 2010]. Vincent, S., 2004. Participation, resistance and problems with the ‘local’ in Peru: towards a new political contract? In Participation: from tyranny to transformation? Exploring new approaches to to participation in development. London; New York: ZED Books Ltd; Distributed exclusively in the U.S. by Palgrave Macmillan, pp. 111-124. Williams, G., 2004. Towards a repoliticization of participatory development: political capabilities and spaces of empowerment. In Participation: from tyranny to transformation? Exploring new approaches to to participation in development. London; New York: ZED Books Ltd; Distributed exclusively in the U.S. by Palgrave Macmillan, pp. 92-108.